Editions Didier – A book written by Rupert Morgan. In the middle of the front cover you can see the name of the book. On the left side you can see a girl: her name is Juliet. On the right side, you can see the boy: his name is Romeo. The story is based on William Shakespeare‘s play. The scene takes place in Las Vegas. 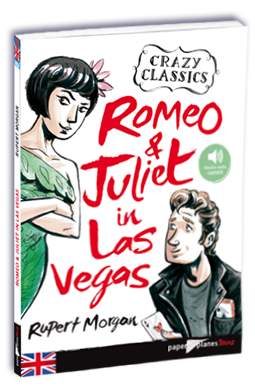 The main characters in the book are Romeo and Juliet. They are young. They belong to the Montague and Capulet families who are rivals. The story takes place in 1979 in Nevada in America. Their love is impossible. Romeo must leave the town and runs away from it because he killed Juliet’s cousin. That’s the reason why Romeo pretends to be dead. It is at this point that Juliet decides to drink poison because she is so desperate. Will they live their love at the end ? I think this book is great because I like romantic stories but I don’t like the end because it is too tragic. According to me, the book is interesting because the story is full of suspense.